Practical city planner, Cassidy Grant, just inherited her sister’s beloved dogs. Except she’s a career girl more into heels and matching accessories. She’s not a dog mom. Worse, she is required to take the furry darlings to the dog park. Jilted at the alter, Ethan Sheppard finally got a dog. And he loves their bonding trips to the dog park. He’s also the secret cartoonist whose drawings poke fun at the city leadership and might hurt the mayor’s chances at reelection. After Cassidy and Ethan meet, she asks for his help to manage the pups, and along the way, he learns she will be fired if she can’t identify the cartoonist to her boss. But telling her will cost his job. Jake pulled eagerly at his leash, his long tail whipping in the air as they neared the park entrance. Swinging the gate open just enough to allow them through, Ethan unhooked the leash, releasing Jake. 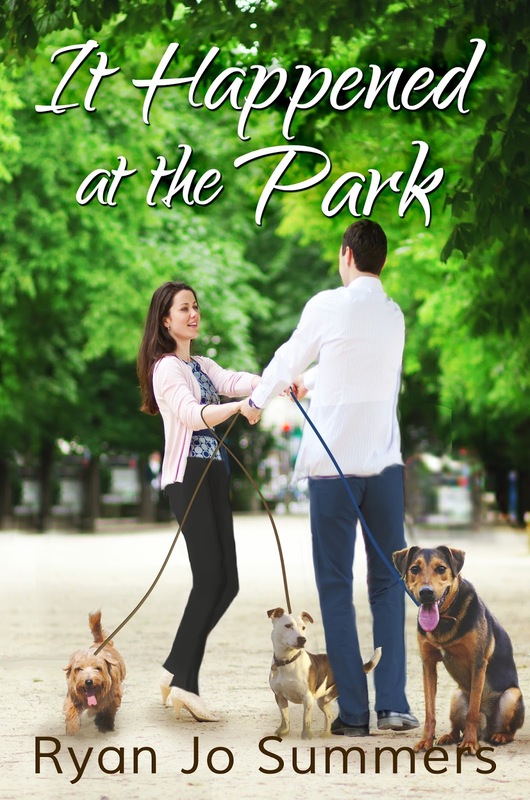 With a bark, he was gone, racing to join his canine pals.Looping the leash through his belt, Ethan stuffed his hands in the pockets of his jeans and studied the attendees. He offered a friendly wave to some of the doggie moms and dads that he knew. A few of the dogs came up, wagging around, begging a pat, before racing off again.